The picture above represents a broadcast (known as the “Arecibo” message), put together by Carl Sagan and colleagues that was sent into space via radio waves at a special ceremony to celebrate the remodelling of the Arecibo radio telescope in Puerto Rico. Apparently, the received a response, you can read more about that story here. It’s speculative, for sure, but the information below, is not. This article pertains to a real deal document. Strange signals detected from outer space are becoming quite popular, especially within the past couple of years alone. Here’s one of several studies positing that some of these signals could be from an intelligent extraterrestrial source. Scientists have discovered six more bursts of radio signals coming from a place in deep space outside our galaxy from where similar signals were detected earlier this year and in 2012. From this specific location, a total of 17 such radio signals have been received, and given their nature, there is also heavy speculation about whether we are being ‘contacted’ by some type of extra-terrestrial life form. You can read more about that here. This article touches upon an NSA document that was released via a lawsuit. Rumours around the internet say the agency was ordered to declassify the document in 2004, but did not officially release it until 2011, which they did so quietly. Not many details are available about the document, except for the fact that it is real, and published in the NSA database via their technical journal. It’s titled “Key To The Extraterrestrial Messages,” and a gentleman by the name of “H. Campaigne” attempts to decode the messages. There was no document to be found that actually describes what exactly they found out, and what that translation was. 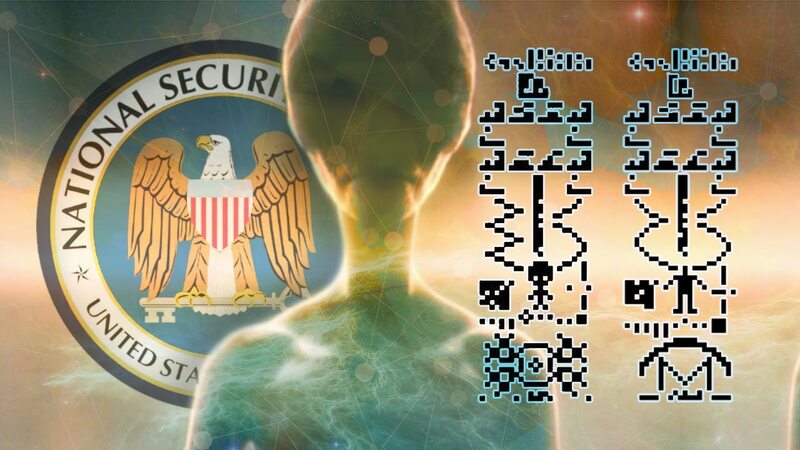 Keep in mind, this is one of thousands of documents that have been released via FOIA requests, and dozens of global intelligence agencies and governments have now released hundreds of thousands of pages of documents that discuss possible extraterrestrial beings. The document is a letter that was sent to the director of the FBI in Washington from the San Fransisco office, on a matter pertaining to UFOs & extraterrestrials. It contemplates an extraterrestrial presence visiting us. There is also an important distinction to be made from the UFO phenomenon, and the extraterrestrial phenomena, although there is sufficient evidence to show that, at least in some cases, they are interrelated. That being said, may of of these “UFOs” could be, and probably are, highly sophisticated, black budget (Special Access Programs, human craft). The existence of UFOs has been officially verified, and thousands of military records show that they are commonly tracked on radar, and perform maneuvers and travel at speeds that no known aircraft can travel. This seems to have started a long time ago, in Germany, and the CIA was keeping tabs. There are hundreds of cases, and it’s something that still happens today. A quite popular incident comes from Tehran, Iran. This incident occurred on the night of September 18th, 1976. A four page U.S. Defense Intelligence Agency and NSA reportdescribes the encounter in detail. Furthermore, both of the pilots involved discussed the event years later. What happened on this night is an example of what has happened multiple times with regard to military encounters with UFOs. Residents of the city noticed a big bright object in the sky. The airport traffic controller also noticed, “it was an intensely bright object that was not supposed to be there.” The Iranian Air Force was contacted (at the time they were a close ally of the United States, under the rule of the Shah), and they dispatched two F-4 fighter jets to check out the object. The United States took this encounter very seriously; a report of what happened was sent to multiple national security officials and U.S. President Gerald R. Ford, CIA Director. Both pilots, when approaching the object, experienced weapons systems and electronic failure within their aircraft. In it is a great shot of one of these “UFOs” snapped by Canadian Military Pilots (see below). I’d like to point out that, although the existence of UFOs is verified, the fact that these could be operated by extraterrestrials is not. That being said, just as there was a lot of evidence for the UFO phenomenon before all of this declassification, there is still “abundant evidence that we are being contacted.” – Dr. Brian O’Leary, Ex Nasa Astronaut and Princeton Physics professor. What points to this fact, is that those directly involved with these sightings, and those who have held some prominent positions, have clearly stated, hundreds of times that some of these UFOs are indeed operated by extraterrestrials. Given the release of this information within these past few years, those that are mentioned in these files have come forward. One (out of many) examples would be now retired Navy commander pilot Graham Bethune, who held a top-secret clearance. He was a VIP Plane Commander who flew most of the high-ranking officers and civilians from Washington, DC. In his testimony below, he explains how he was flying a group of VIPs and other pilots into Argentia, Newfoundland, when every single person on the plane witnessed a 300 foot object that traveled 10,000 feet straight up in a fraction of a second toward their plane. As you can see from the video below, he has documented the event extensively. To access the official files pertaining to this particular case, you can visit the government’s ‘Project Bluebook’ files to read them. You can find those links and the files for this case at the National Investigations Committee On Aerial Phenomenon. So, as you can see, there is no shortage of information within this realm, in the form of credible sources and documents and statements from credible people. This isn’t even the tip of the iceberg.